This chapter contends that it is not sufficient to consider literary texts solely as a means of language input; we need some way of accessing all the other factors which contribute to their meaning for the reader. 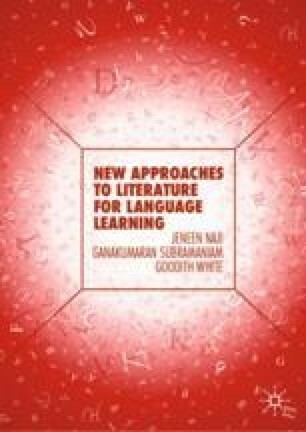 The writers focus on two ways of reading literature: text-based and literary critical approaches, and argues that both these approaches make assumptions about the nature of language, so are of relevance to language teachers. The chapter further explores, within the framework of the literary critical approach, points of engagement such as race, gender, culture, history, psychology, and the environment, providing the teacher with ways into the text and ideas for designing teaching materials. Blake, W. (1789). Songs of Innocence and of Experience, Copy C, 1789, 1794 (Library of Congress): Electronic Edition. Retrieved January 5, 2018, from www.blakearchive.org. Glotfelty, C. (1994). What Is Ecocriticism? Defining Ecocritical Theory and Practice. Retrieved March 8, 2016, from http://www.asle.org/wp-content/uploads/ASLE_Primer_DefiningEcocrit.pdf. Hedges, W. (2007). Timeline of Major Critical Theories. InsideSou. Available at www.sou.edu/english/hedges. Leipzig, D. H. (2001). What Is Reading? WETA. Available at http://www.readingrockets.org/article/what-reading. Mastin, L. (2008). Structuralism. Basics of Philosophy. Available at http://www.philosophybasics.com/movements_structuralism.html. Said, A. S. (n.d.). Available at http://fauzanimj.blogspot.my/2012/05/dead-crow-he-saw-death-crow-in-drain.html (Poem submitted May 10, 2012).